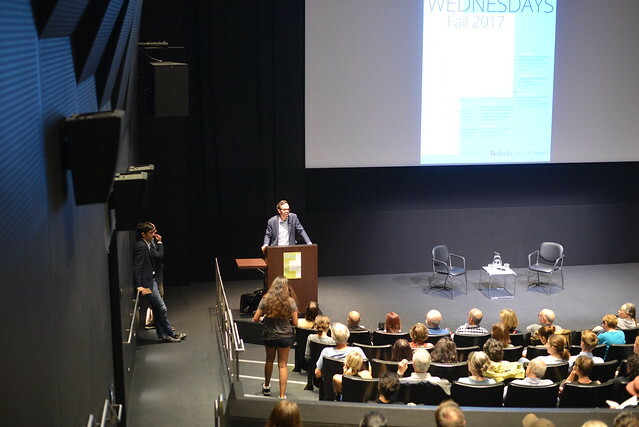 The 2017-18 ATC lecture series kicked off last week with Franklin Foer, former editor of The New Republic and author of the new book World Without Mind: The Existential Threat of Big Tech, in conversation with Nicholas Thompson, editor in chief of Wired magazine. The two discussed the state of journalism today and the threat to intellectual life posed by big tech. Foer argues that leading tech firms - Google, Apple, Facebook, Amazon - while purportedly enacting utopian principles of individuality and global connectivity, are actually eroding public discourse and leading to greater conformity of thought. According to Foer, when journalism is motivated by clicks, the quality declines, becoming ever more sensational and polarized, a phenomenon he suggested culminated in the 2017 US Presidential election with the role that social media played in Trump’s candidacy. Foer recounted the story of his tenure at The New Republic as a cautionary tale about what happens when Facebook and numbers drive journalism. The eminent publication was bought by Facebook co-founder Chris Hughes at a time when the magazine, like much print journalism, was struggling. Hughes brought to the publication an infusion of money, enthusiasm, and ideas about how to use the Internet to save journalism. Ultimately what Foer saw happening was that journalists, himself included, were more motivated by clicks and views than by journalistic principles. Foer and Thompson discussed tech culture’s roots in the counterculture of the 1960s and 1970s, beginning with Stewart Brand’s Whole Earth Catalogue. (A history traced in great detail by Fred Turner in From Counterculture to Cyberculture, University of Chicago Press, 2008.) For Foer, hippie utopianism, with its emphasis on connection and oneness ultimately led to a tech culture in which monopoly was inevitable; the countercultural privileging of individuality and lack of trust in the government contributed to the lack of regulation that Foer sees as so problematic with big tech today. “Big tech stands between us and information,” Foer said. “They are different from monopolies that have come before - they aspire to encompass everything.” Foer gave the example of Google: not content to stop at “organizing all knowledge,” the information company now develops self-driving cars. Amazon is not only the “everything store,” but also a cloud data storage company, a movie studio, and an organic grocer. Frank Foer’s father was the prominent antitrust lawyer Albert Foer (whom Nick Thompson interviewed for one of his first big pieces as a young journalist), which has clearly influenced Foer’s thinking on how to face the “existential threat” of big tech. For Foer the way to “preserving a competitive thought economy” is to break up the tech companies. Although Foer acknowledged this would be unlikely, he advocated for increased regulation and greater transparency in how they do business - citing the recent revelations about the role Facebook played in the Russian spreading of misinformation during the 2017 election.